Corresponding authors from TU/e and other Dutch universities can publish primary research and review articles in open access free of charge in most of the 1300+ Wiley subscription journals, known as the Wiley OnlineOpen program journals. This agreement applies for all articles accepted after 4 March 2016. The agreement does not include “full open access” journals from the Wiley Open Access program. 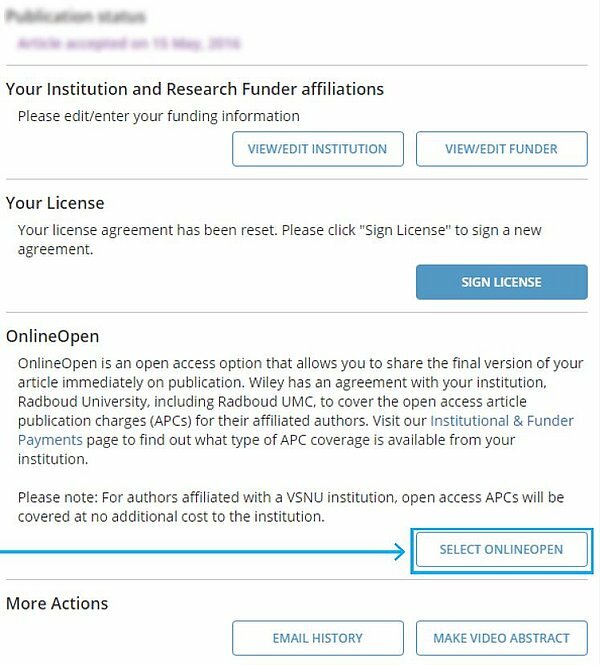 If you publish your article in one of Wiley's "full open access" journals you will have to make your own arrangements for covering the publication costs. How to publish your article in open access under this agreement? Log-in or register on Wiley’s “Author services” and select your TU/e affiliation. Choose “Select OnlineOpen” (see image below). Based on your TU/e affiliation, the article processing costs will be waived. Wiley will confirm this by email. This offer to publish open access free-of-charge is valid until your paper is published online. Do make use of this possibility directly upon acceptance to avoid facing costs later. If you have any further questions, please contact the IEC Open Access desk.